THE Bruce Highway north of Bowen is expected to be closed in both directions until at least midnight, Queensland Police have confirmed. A spokesman said at 2.20pm a truck, carrying fuel, and two vehicles collided on the Bruce Highway just north of the Collinsville turn off. Motorists are urged to delay travel and Forensic Crash Unit officers are investigating. Earlier, police on the scene of the major traffic crash confirmed three people were killed. Speaking to a reporter on the scene, a police spokesman confirmed the tragic deaths and said the next of kin were being notified. The Bruce Highway was closed indefinitely and forensic officers were enroute from Townsville. A Queensland Fire and Emergency Services spokesman said crews were working to clean up about 11,000 litres of diesel. A Queensland Ambulance spokeswoman said the driver of the fuel tanker was able to get safely out of the vehicle. 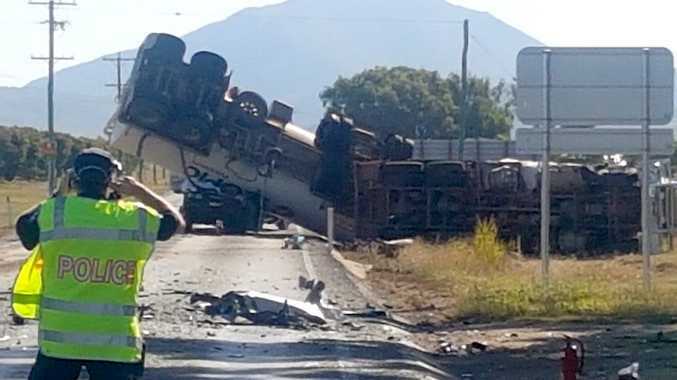 EARLIER: A FUEL tanker has crashed head on with a car in a serious traffic crash on the Bruce Highway, north of Bowen. Queensland Police confirmed fuel is leaking from the tanker and the highway is closed in both directions. It is expected to be closed for some time. The crash happened about 2.25pm on the Bruce Highway, 4.2km north of Bowen. It is understood another car may also be involved. Paramedics are assessing multiple patients on the scene, with details of the extent of their injuries unconfirmed at this stage. Two firefighting crews are also on scene.